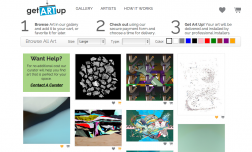 GetArtUp is a web marketplace offering original contemporary art on a monthly subscription model. Customers can get access to expensive fine art for a low monthly membership fee and artists make recurring income from their work, gain fans, and a sales channel. The art on the site is for sale as well. a- shoppers like to get credits for goods they might buy so offering that in exchange for contacts up front might incentize them to make a purchase as well. Shoppers also like to show offer their taste and get feedback from others, be known as tastemakers, like with Pinterest, by sharing their contacts the product becomes more interesting. b artists are motivated by: reputation and being featured, money from seliing or renting works. They like to know what others think about it and hear nice things such as comments and praise. Artists are often more motivated by praise and reputation than by money. -Artists get a cute email every time someone likes their work or comments. They then can share that email socially. Artists can see the number of likes they have, so sharing it with more to increase likes would be likely. -Customer/user gets a $55 credit for every customer that purchses with our invite code. -Customer/user gets entered to win a year subscription for being the first to like a peice on facebook, new weekly winners. "like this peice? share it on facebook and be entered to win a 1 year of art"
-Users create Art Wall to show off their likes with friends, top curators who bring in most invites get $$ or credit to spend. -Artists with most likes filter to the top of the page, incentivizes artists to get more likes- share Kind of like Yelp but no cash is involved, only social proof. Trending art is always at the top page of our infinite scroll. -Refer an artist, if you are an artist, and get a $50 Blick card to buy art supplies.